The ultimate performer, smooth, safe, stable, dry, and has multiple storage and space facilities. 2.4 mtr, Incredibly strong polyethylene moulded, plastic. Double skinned tri hull design gives exceptional stability. Built in storage locker, rod holders, & drink holders. Various colours available including green for Duck Shooters. 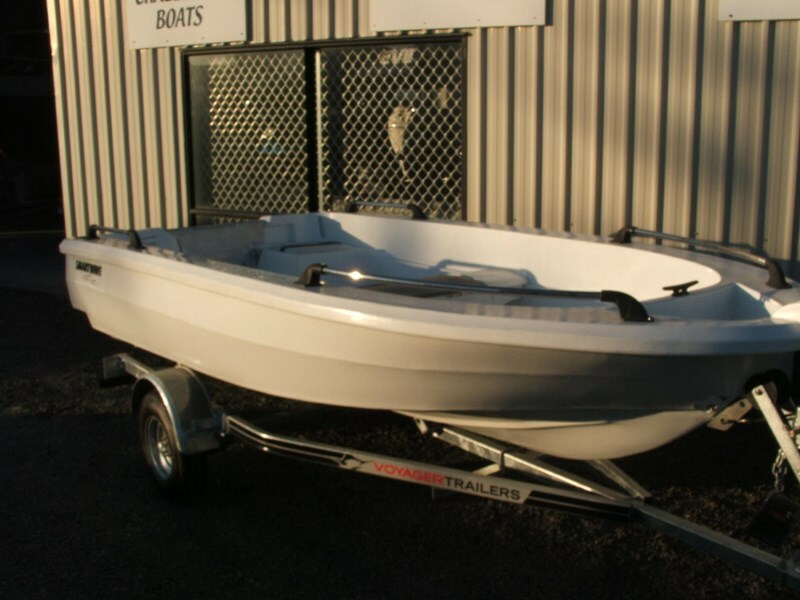 Looking for the best this is it What the boaties have wanted and needed is all available in this Perfect for Fishing Smartwave SW4200. Wow! You wont beat this boat for Stability, Safety, Dry & Smooth Riding even in the rough waters and best of all it is seriously user-friendly. With its flat internal floor and hidden conduits, all cabling for steering etc. is right out of the way allowing for an excellent safe and clean layout. This means the boat is ideal for the serious fishing guru or the whole family kids and all. Currently in the sales yard complete with a 40hp Evinrude E-TEC engine and ultraflex trailer. Features Transom 20-inch Long Shaft Centre Seat/Storage Bow Tow Eye Rear Floor Drain Rod Holders Drink Holders Bow/Stern Rails Front, Middle and Rear Storage Anchor Storage Flat Floor Hidden Cabling Provision Specifications Model-sw4200 Horse Power-40 Length-4300mm Beam Exterior-1930mm Internal Height-580mm Dead Rise-16.5 Degrees Hull Weight-220kg Hull Thickness-10mm Capacity-590kg Adults (max)-5 Transom Capacity-105kg Transom Size-20 inch **** PENINSULA MARINE *** Peninsula Marine is the Coromandel peninsulas longest standing marine dealership Established in 1984. Located at 67 Kopu road, Kopu Thames. Open weekdays 8am-5pm, Also open Saturdays 9am-12pm. We sell Marco and Ultimate boat packages from our Kopu showroom and workshop. Also, we are Licenced dealers in Mercury and Evinrude, but service all makes and models in our highly functional workshop. We also have a workshop in the Whangamata Marina hard stand, working on all makes and model of diesel inboards. All work undertaken by trade qualified technicians. We offer finance through Mercury Finance on new mercury outboards, normal lending criteria applies. Please contact for more information. We also have a fleet of two mobile service vans, ready to take a trip anywhere around the Coromandel peninsula to work on your boat. Alan Thomsen 07 868 9066 info@peninsulamarine.co.nz PENINSULA MARINE for Marco, Ultimate, Evinrude, Mercury, Smartwave, and Garmin electronics. The Smartwave 2400 skippa is an extremely tough vertsitile dinghy ideal as a tender and for fishing, duckshooting or recreation,comes with oars, and is rated to a 5hp outboard.